IAP Fine Art: open Fri 12.30 - 6.30pm, Sat 12 - 4pm or by appointment (except Good Friday Apr 10th). Our exhibition coincides with the permanent installation and unveiling by the Bishop of London of Chris Gollon's 14 Stations of the Cross in the historic grade-one listed Church of St John on Bethnal Green, designed by Sir John Soane. The installation of this major series of paintings, which were 9 years in the making and have been widely featured in the national media, will transform St John's into an important visitor attraction in East London. The installation coincides with award-winning novelist Sara Maitland's book "Stations of the Cross", featuring and partially inspired by all 14 of Chris Gollon's paintings. This exhibition features the only remaining studies for this historic commission available for sale. These include "Jesus Takes Up His Cross (First Version)", which features the Jesus Chris Gollon had imagined, before he took the bold decision to use his own son as the model for Jesus in the final works. We also exhibit "At The Base of the Crucifixion", which features The Magdalene from the Stations comforting two distraught children, one which echoes the child in Station II. Having used his own son as the model for Jesus, his daughter as Mary and his wife as Veronica, Chris Gollon chose not to paint himself into any of the 14 paintings of Jesus' last journey. Instead, in just one painting, "Judas Iscariot & The Magdalene", he chose to paint himself as Judas, hanging from the tree, with a note of apology pinned to it. Looking on is The Magdalene. If we are wrong, please let us know, but to our knowledge this is the only painting in art history of Judas alone with the Magdalene, after his betrayal of Jesus. Gollon was partially inspired by the Bob Dylan lyric: "I can't think for you/You'll have to decide/Whether Judas Iscariot/Had God on his side....'. The exhibition features working drawings, and silk-screen print and etching studies for the Stations. 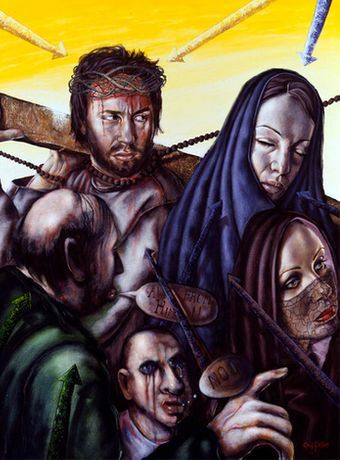 To view all 14 Stations of the Cross, please visit http://www.chrisgollon.com/Commissions/Stations_of_the_Cross.html.